We’d love your help. 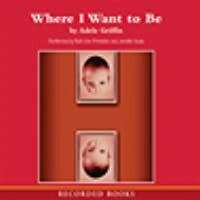 Let us know what’s wrong with this preview of Where I Want to Be by Adele Griffin. To ask other readers questions about Where I Want to Be, please sign up. Hello. I really enjoyed reading this book. After I read great books, I usually look for online quizes to take, to make sure I understood the text. I looked for quizzes on this book, but could'nt find anything. Could anyone maybe make a quiz for this book? Thanks! Two sisters, Jane and Lily. Jane suffers from severe depression, and while the author doesn't mention schizophrenia, it appears that Jane also is in the throes of hearing voices and slipping in and out of reality. The family is loving and understanding and tries to the best of their ability to help Jane. When she dies in an accident, they are left wondering if it was purposeful. Lily is left with grief. The subject matter is intense, but somehow the writing style lacked depth. I cannot recommend th Two sisters, Jane and Lily. Jane suffers from severe depression, and while the author doesn't mention schizophrenia, it appears that Jane also is in the throes of hearing voices and slipping in and out of reality. When I was at the library, I was looking around for a shortish book because technically I'm supposed to be focusing on my ebooks. I thought I'd see what Adele Griffin books were on the shelf since I'd already read two and enjoyed them a lot. When I saw that this book focused on two sisters, I was sold. It alternated between third-person perspective about older, now dead sister Jane and first-person perspective from younger, still living Lily. The sisters are just a year apart in age but are world When I was at the library, I was looking around for a shortish book because technically I'm supposed to be focusing on my ebooks. I thought I'd see what Adele Griffin books were on the shelf since I'd already read two and enjoyed them a lot. When I saw that this book focused on two sisters, I was sold. It alternated between third-person perspective about older, now dead sister Jane and first-person perspective from younger, still living Lily. The sisters are just a year apart in age but are worlds away in personalities. Lily is acclimated to the outside world, popular with a boyfriend and a cheery disposition. Jane prefers her solitude where she can pretend and she struggles with Lily's easy acceptance into the outside, away from their house, their family, and her. The book only covers a couple of days after the death of Jane, switching between Jane's path to an afterlife and coming to an understanding about her life and Lily's struggle to move on. In general I preferred Lily's narration because of the personality that accompanies a first-person narration and because I was fascinated by her relationship with her boyfriend Caleb, her anchor who keeps her from sinking in grief. Jane's story is more remembrances of her history and eventually quick segment about her death. Although I had expected a highly emotional read based on my feelings about sister-sister stories where one of them is hurt or dead, I did not get that from this story. I felt sad for them as their relationship didn't end on a positive note and I was happy that they got a measure of closure. But I had anticipated crying and an internal ache, which I did not have at the end. I think this book, Where I want to Be, is very boring. In the first 15 chapters it talks about a depressed girl named Lily who thinks the death of her older sister Jane could have been all her fault. Lily just depends on her boyfriend for comfort and protection. Her sister Jane was killed when she was ran over by a car at the age of 18. Jane had mental issues and never wanted to grow up; she had an overactive imagination. This book confused me because in the beginning of the book she was a 7th g I think this book, Where I want to Be, is very boring. In the first 15 chapters it talks about a depressed girl named Lily who thinks the death of her older sister Jane could have been all her fault. Lily just depends on her boyfriend for comfort and protection. Her sister Jane was killed when she was ran over by a car at the age of 18. Jane had mental issues and never wanted to grow up; she had an overactive imagination. This book confused me because in the beginning of the book she was a 7th grader and at the end she was an angel trying to forgive Lily. The star rating I would give this book is 2 stars. The novel was powerful,but not enough to drag me in. There is one or two interesting chapters, but there is no climax. It seems as if Adele Griffin just wrote a boring summer down on a piece of paper and called it a book. I would not recommend this book because of it's lack of interest, action, and excitement. It's probably something I would enjoy when I get older. I would rate this a 3.5 but as that is not possible I've rounded it up to a generous 4 - 3 would have been a bit low. The story of 2 sisters Lily, and Jane who suffers from a mental illness and lives somewhat in a world of her own. Written mainly in the aftermath of the suicide/accident of Jane, it tells how Lily struggles with her sisters death, while growing overly dependent on her boyfriend Caleb. The chapters are written alternatively between Lily and Jane. This is quite a beautiful book in I would rate this a 3.5 but as that is not possible I've rounded it up to a generous 4 - 3 would have been a bit low. The story of 2 sisters Lily, and Jane who suffers from a mental illness and lives somewhat in a world of her own. Written mainly in the aftermath of the suicide/accident of Jane, it tells how Lily struggles with her sisters death, while growing overly dependent on her boyfriend Caleb. The chapters are written alternatively between Lily and Jane. This is quite a beautiful book in a way, although I don't like stories that leave the ending a little loose which this does. Though this was a pretty good book, it wasn't one of my favorites. (as you can see, i have to experience writing reviews :P) I just wanted people to know that this book is one that leaves you hanging in the end, you don't find out exactly what happens, it's up for the reader to decide I guess. I just wanted to warn people like me, who depise not finding out what happens. That's all from me. this is one of my favourite books in the world i loved it so much im on the verge of tears every time i remmber it it was a super loving lovely book i hope to read it againe some day and i recomend it to evryone. Lily's sister Jane unexpectedly died her senior year and this novel explores the sister's path to acceptance and healing. I must be a masochist because Adele Griffin keeps kicking me in the gut and I keep coming back for more. I mean this as a compliment. Her books make me feel on a gut-wrenchingly real level. Don’t be deceived by the tiny page counts: Adele knows how to make every single word count and come together to create a powerful story. Her choice to use alternating narratives (one first person, one third person) was a stroke of genius, subtly adding incredible depth, characterization and atmosphere that would not have been accomplished as well with a different narration style. But I do have a sister. I do have grandparents. I have experienced loss. At their core, the relationships and feelings described in this book are something I can relate with deeply. The book where i want to be by Adele Griffin is about a girl named Lily and her big sister Jane that were totally different but looked like twins. Jane was always a shy girl and never had much friends growing up, she was always teaching Lily to play make-believe, make-believe was a game that Jane really enjoyed playing while she was growing up, it was her escape from reality. But while Lily was growing up she was always hanging out with her many friends and even dating some guys. “For Jane, the The book where i want to be by Adele Griffin is about a girl named Lily and her big sister Jane that were totally different but looked like twins. Jane was always a shy girl and never had much friends growing up, she was always teaching Lily to play make-believe, make-believe was a game that Jane really enjoyed playing while she was growing up, it was her escape from reality. But while Lily was growing up she was always hanging out with her many friends and even dating some guys. “For Jane, the line between fantasy and reality had always blurred, whereas for Lily lived for a future bright with expectation and change.” (back cover) Lily had fallen in love with a boy named Caleb but the only problem was that Jane loved him first. Jane was frustrated that her little sister has eclipsed her all Jane could do was watch. Lily and her sister were growing further and further apart and then one day something terrible happened that changed Lily’s life forever. She wished she had more time and that she payed more attention but she didn’t and she regrets it. 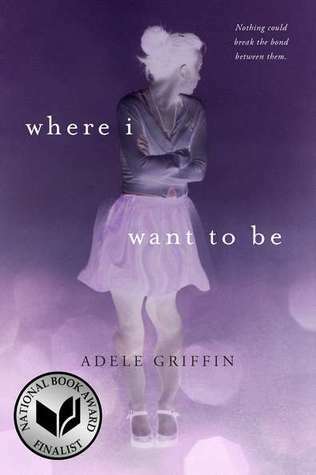 Read the book where i want to be by Adele Griffin to find out what happened that left Lily and her family in pain and tears. I think the book where i want to be by Adele Griffin is a great book filled with lots of drama, so if you are into drama this would be a great book for you. In this book there were many different perspectives of different people. I thought it was interesting how every chapter it would change from Jane’s point of view how things used to be and Lily’s point of view how things are and used to be. There are many party of this book that are unanswered, this book mainly talks about how Jane and Lily grew up but it doesn’t tell what Janes special needs condition is. I think the reason Jane and Lily weren’t so close is because of Jane’s condition, Lily wanted to do her own thing as a teen and Jane also wanted to do her own thing. But during this time Jane was doing what she had to do as a big sister, comforting Lily when there were thunderstorms and talking to her when she was sad. I think that you should go and take a look at the book and maybe try it out, you never know, you might like it! From this book I definitely learned to not take things for granted and spend more time with the people you love because not everything will stay forever. I would give this book a 4-5 stars because it was a very good book and nicely detailed, but it was missing some parts to it, like what Jane’s Special Needs Condition is and it doesn’t really talk about how her mom and dad handled things and it also didn't talk about Lily much from Jane’s perspective, it was all about Augustus and Grandpa at there house that Jane called Orchard way. And on Lily’s side it didn’t talk about Jane so much it was mostly about her boyfriend Caleb and them hanging out. I think it would be 5 stars if it wasn’t missing parts like that because it would make the book so much more interesting and wanting the reader to keep reading the book. I think the author should have put more information in because, the more information the more interesting and the reader would want to read on and possibly read more of Adele Griffins books. This book is a very short book about 160 pages in the book so it is fairly short and it is a quick easy read. From the effort put into making this book and the information that was in it, I think I would go and read another book by Adele Griffin. The book “Where I Want To Be”, by Adele Griffin, is about two sisters named Lily and Jane. Jane was always a shy girl and never had much friends growing up. She always wanted to play make-believe with her younger sister Lily. Jane loved playing make-believe because it was an escape of reality for her. But Lily was growing up and she started hanging out with friends and started dating. “For Jane, the line between fantasy and reality had always blurred, whereas for Lily lived for a future bright w The book “Where I Want To Be”, by Adele Griffin, is about two sisters named Lily and Jane. Jane was always a shy girl and never had much friends growing up. She always wanted to play make-believe with her younger sister Lily. Jane loved playing make-believe because it was an escape of reality for her. But Lily was growing up and she started hanging out with friends and started dating. “For Jane, the line between fantasy and reality had always blurred, whereas for Lily lived for a future bright with expectation and change.” Lily fell in love with a boy named Caleb. As Jane noticed that Caleb and Lily were together, she was jealous. Jane loved Caleb first and it hurt her to know that her sister took him away from her. As Lily and Caleb were together more, Jane and Lily were growing further apart. Jane would get upset when Caleb would come over and Lily wouldn’t include her. Jane felt as if she had nobody. She was lost and hopeless. Then one day changed Lily’s life forever. Lily was lost without the one thing she needed. She regretted not being there for Jane, not paying enough attention, and not hanging out with her. Lily and her family were never the same. I think this book was great. It was tragic to find out the history of Jane and Lily. The book is in two perspectives, Jane’s and Lily’s. While Jane’s is in past tense and Lily’s is in present tense. The every chapter switches between Jane’s point of view and Lily’s. A lot of the book tells you how Lily and Jane grew up. It doesn’t tell you what Jane’s special needs condition is though, it’s a mystery. As they grow up they really start to grow apart though. I think it’s because Lily wants to hang out with friends and her boyfriend over Jane. Jane always wants to be with Lily because Lily’s really the only friend she has. Jane just kind of stays as a kid, she doesn’t want to grow up. Then Lily is doing all the things Jane has dreamed of doing, but can’t. Although Jane and Lily were close in a way. Jane would comfort Lily in a thunderstorm and talk to her when she was upset. I think this shows to not take family for granted. Family will always be there and you do need to spend time with them. Yes, you need to hang out with friends but you want a good relationship with your family. I would give this book 4 stars. It was a great book, but it left out some parts that could’ve been helpful. Like they leave out Jane’s special condition and I think it would’ve been helpful to have a chapter about how her parents dealt with the issue. Lily’s point of view was more focused on Caleb and I think it should’ve had more of Jane in it. Other than that I thought it was great! When i saw this book at the library on top of the bookshelf i thought it was really there for me, it was destiny and i had to read it. Its title was very depressing, because where i want to be reminds me of college and the real world, where i will be on my own leaving my past behind. In this case, Lily the protagonist is leaving her past behind, where her sister was once in. Her sister jane is a girl with mental health problems, she always question things and wasnt outgoing. Lily and jane are sisters, yet they have different personalities due to Jane's disability. Jane had died in a car accident, well people didnt know if that was an accident or if jane planned it to leave this cruel world. Lily and her boyfriend Caleb had became closer as a couple, leaving Jane behind as an outcast, this contributed to Jane's death as lily supposed. Lily was always blaming herself for jane's death, but she never think of it like it was jane's purpose of wanting to die and she was putting all the blame to herself. In the end, Caleb did open Lily's heart by tell her to leave the past behind, because what happens happened and she should live every minute of the future. Lily was glad, because after all she was blessed with jane for over 15 years. This review has been hidden because it contains spoilers. To view it, click here. “Where I Want To Be” is a fantastic novel. Although the book was quite confusing at first, by the end of the book, you understand everything. This particular novel goes back and forth between Lily and her sister, Jane, who suffers from schizophrenia and depression. Jane feels as if nothing is wrong but she knows that she is different from everyone else and made a decision that would change her life. In the first few chapters, Lily talks about the death of Jane and how she felt as if she could ha “Where I Want To Be” is a fantastic novel. Although the book was quite confusing at first, by the end of the book, you understand everything. This particular novel goes back and forth between Lily and her sister, Jane, who suffers from schizophrenia and depression. Jane feels as if nothing is wrong but she knows that she is different from everyone else and made a decision that would change her life. In the first few chapters, Lily talks about the death of Jane and how she felt as if she could have prevented her older sister’s death. Nobody knows why she would have walked out into the street as the light turned green, but Jane knows. Jane’s disorder drives her to hear voices of inanimate objects and makes her float out of reality. She knows these objects and animals cannot talk but they talk to her, she assures herself that it’s not reality, but that’s the reality of a schizophrenic. Jane decides to quit taking the medicine her doctor prescribed to feel normal again, but after that, everything went down hill. She becomes very mad one day at her sister and decides to leave, her keychain, begins talking to her and telling her that she does not belong here. Makes her get out of the car and walk to the street. She doesn’t know why, but as soon as the light changed from red to green, she stepped onto the pavement and that was it. The only reason Griffin’s book is confusing is because it goes back and forth between the two sister, but one of them is dead. Jane’s story is told from a third person point of view while Lily’s is told in first person. Jane is staying with her grandma and grandpa at their house on Orchard Way, where every day is perfect and nothing goes wrong. Towards the end of the novel, Lily and her boyfriend Caleb visit Orchard Way to feel close to Jane. The chapter switches to Jane as she describes her sitting in the pool listening her sister and Caleb reminisce on memories of Jane and how much they missed her. Griffin does a marvelous job at portraying Jane’s illness and making the reader feel as if they are part of the story themselves. I highly recommend this book to anyone who likes haunting and extravagant novels. this book was amazing. I definitely would read this again and again! This review has been hidden because it contains spoilers. To view it, click here. There's two sisters, Jane and Lily. Jane was older than Lily by a year. Jane had mental issues and never wanted to grow up. Her disorder sometimes makes her think that animals or objects are talking to her. Lily was loved by everyone and no one really talked to Jane. In the beginning of the book it says Jane was killed when she was ran over by a car at the age of 18. It was during senior week. Lily often thinks Jane's death was her fault. Lily just depends of her boyfriend for comfort and protec There's two sisters, Jane and Lily. Jane was older than Lily by a year. Jane had mental issues and never wanted to grow up. Her disorder sometimes makes her think that animals or objects are talking to her. Lily was loved by everyone and no one really talked to Jane. Lily just depends of her boyfriend for comfort and protection. Jane hated Caleb because he was always with Lily and she felt like she was being pushed away. Jane is staying with her grandparents at their house in Orchard Way. She thinks everyday is perfect and that nothing goes wrong. The book goes back and forth from Lily's point of view to Jane's. One day Jane decides to stop taking her medicine but after that everything started going wrong. Jane gets really upset at Lily and leaves. Her keychain starts talking to her saying she doesn't belong there. It makes her get out of her car and walk towards the street. As soon as the red light turned green, she steps into the pavement and that's when the car hit her. Towards the end Caleb takes Lily to her grandparents house. She barely recognizes it since its in really bad shape. They go back to the pool and talk about Jane about how the miss her. She felt as if she was closer to Jane. Caleb then tells her to let go of her past because what happens happened and she should live every minute of the future. One thing I dislike from this story was that it was told from Lily's first person point of view and Jane's story was from third person point of view. It kept switching back and forth. Maybe that’s how changes are made. Maybe the moment right before you’re ready to move on is always when it’s hardest to let go. Jane’s the big sister - the one who always created the make-believe games she and Lily played growing up…like when they were at Augusta and granpa’s house. Augusta was the ultimate grandma - no matter what Jane did - Augusta never looked angry - fierce sometimes, shocked, but never angry. Even when Jane smashed Augusta’s crystal vase into a thousand needles all over the Maybe that’s how changes are made. Maybe the moment right before you’re ready to move on is always when it’s hardest to let go. Even when Jane smashed Augusta’s crystal vase into a thousand needles all over the front hall - even when Jane let Piccolo - her grandparent’s parakeet, out of his cage and watched him fly away into the woods - never to return. Jane loved going to Augusta and granpa’s house - she’d named their place Orchard Way and got Lily to play along with her in imaginary games. Jane would put coins in a Ziploc bag and bury them - then Lily would spend the day with a map and a shovel, digging for the buried treasure. But Jane never grew up and Lily, the younger sister, had to be the grown up one. She stopped playing Jane’s games, started seeing Caleb, and Jane was left behind, left out, alone. Jane and Lily are sisters who are very close as children, but start to grow apart as teenagers. Jane creats vivid imaginary worlds and prefers her imagination to real life. Lily prefers the real world and is popular and outgoing. When her family finally realizes that Jane is mentally ill, she starts taking antipsychotics and talks with a therapist. The diagnosis was not explicit, but I thought her symptoms sounded like schizophrenia. As Lily becomes more and more a part of the outside world, Jan Jane and Lily are sisters who are very close as children, but start to grow apart as teenagers. Jane creats vivid imaginary worlds and prefers her imagination to real life. Lily prefers the real world and is popular and outgoing. As Lily becomes more and more a part of the outside world, Jane feels increasingly isolated. When Jane decides to stop taking her meds in order to feel "normal," she ends up dead. The novel is narrated in alternating chapters from each sister's point of view, even though one is alive and the other is dead. I found this one difficult to get interested in, but if you can make it past about the first 40 pages, Jane's character becomes compelling. The ending is gorgeous (and sad) as each sister comes to terms with their relationship and is able to move on. Fairly well written, but... difficult to read. And not in a good way. Though Jane's actual diagnosis is never mentioned, it seems to be implied that she has schizophrenia... and yet she is characterized with traits of half a dozen other disorders as well. While many mental illnesses are frequently comorbid--for instance, it's fairly common to see people with multiple anxiety disorders--Jane's characterization just feels wrong. Additionally, Jane's illness is more or less the entirety of her chara Fairly well written, but... difficult to read. And not in a good way. Though Jane's actual diagnosis is never mentioned, it seems to be implied that she has schizophrenia... and yet she is characterized with traits of half a dozen other disorders as well. While many mental illnesses are frequently comorbid--for instance, it's fairly common to see people with multiple anxiety disorders--Jane's characterization just feels wrong. Additionally, Jane's illness is more or less the entirety of her character. In the whole book, we learn very little about her. She is very attached to her grandparents, she is mentally ill, she resents her younger sister, and she is dead. That's about it. That's not much of a character. I listened to this book on CD. It takes place in alternating chapters, each one narrated by a different sister. Jane has recently died in a terrible accident and it takes awhile to understand that her chapters are written in the present tense, as she recreates daily the "perfect day", visiting their grandparents. Lily is younger and she has always had a difficult time being Jane's sister. Jane had mental and emotional problems that embarrassed her and that now cause her lots of guilt. The narrato I listened to this book on CD. It takes place in alternating chapters, each one narrated by a different sister. Jane has recently died in a terrible accident and it takes awhile to understand that her chapters are written in the present tense, as she recreates daily the "perfect day", visiting their grandparents. Lily is younger and she has always had a difficult time being Jane's sister. Jane had mental and emotional problems that embarrassed her and that now cause her lots of guilt. The narrators are good, but Jane's is done by an older woman, which I found disconcerting. Jane died as a teenager. Lily's narrator sounds exactly the right age. Not too shabby for a debut novel. I appreciated her portrayal of a schizophrenic teenager. Granted, I have no idea how accurate it is, but it seemed realistic enough. Switching from first person POV for Lily to third person omniscient for Jane was effective, especially when their "tellings" overlapped. I was particularly engaged when Lily would describe Jane's episodes and how they effected her (Lily). It was reminicent of (though I hate this expression) a poor man's Skin by Vrettos. A decent 2 d Not too shabby for a debut novel. I appreciated her portrayal of a schizophrenic teenager. Granted, I have no idea how accurate it is, but it seemed realistic enough. Switching from first person POV for Lily to third person omniscient for Jane was effective, especially when their "tellings" overlapped. I was particularly engaged when Lily would describe Jane's episodes and how they effected her (Lily). It was reminicent of (though I hate this expression) a poor man's Skin by Vrettos. A decent 2 day train read- It held my just as much of my attention as I was willing to give up. This is the story of Lily and Jane. They are two very different teenage sisters. Lily is outgoing and popular. Jane is introverted and avoids social events. She also suffers from mental illness. As children they were very close, but as adults they have drifted apart. When their grandfather dies life become more difficult for Jane and she has a difficult time coping, especially now that she no longer is as close to Lily. This book is a fairly quick read, but offers some good discussion topics. This is one of those stories it's hard to explain without potentially giving it away...though I'll say they did a good job with the teaser on the jacket. ...You've got Lily, you've got Jane. Throughout the book we volley between their points of view, and their lives. Lily has always fit right in, Jane has never felt at home. Two complete opposites. But they're sisters. Follow along as these two come to grips with their alternate realities in ways you might not expect. It's about two sisters who each narrate sections of the book, one living, one recently passed away. It's an exploration of siblings, one of them who is troubled by mental illness and one of them who is not, for whom everything comes so much easier. This books feels like a short journey in coming to grips with the past from two different perspectives. Of acceptance and letting go.